a software that works on a Windows PC/tablet, a Win32 desktop application. with native Touch interface support (down/up/move. no swipes or gestures). particularly good for the most basic musical trainings. Do-Re-Mi and Fa-So-La-Si are parallels, you know. Dulcimer and (an octave lower) Violin (Contrabass), in 7/24 meantone. An interval can be represented fully by coordinates (a,b), where a and b are any basic interval elements. For example, If you pick out a second (up) and a minor third as the two basic elements, (1, 0) and (0, 1) respectively, then a fifth is (2, 1), two seconds and one minor third, and an octave is (3, 2), three seconds and two minor thirds. They map naturally to planar shapes, you see them. Those keyboard layout styles which date back to Bosanquet and are now sometimes called isomorphic can be considered as related to intervals 2D-ness. Harmonic-series tones are so fundamental that they must be related to 2D intervals, 2D intervals assigned between them. 3-5 pure major 6th, 5-8 pure minor 6th. You can use in-between intervals in such places as 1-7 and 1-11. Given 2D intervals, you see Harmonic-series tones. It is good to try many tunings. 2D intervals allow wide range of tunings. Harmonic series tone 9-10 as 2nd and a pure octave gives 1/2 comma meantone. A pure minor 3rd and a pure octave gives 1/3 comma meantone. A pure major 3rd and a pure octave gives 1/4 comma meantone. A 5th with width 7/12 of a pure octave, and a pure octave gives what is called 12-tone equal temperament (12ET). A pure 5th and a pure major 3rd gives a tuning with a non-pure large octave. One way often seen is that you define scale tunings in an octave range and then copy them up/down octaves. The default tuning in the initial settting of Intervalon is the following one, which can technically be called 7/48 comma meantone. 7/48 = ( (1/3 + 1/4) / 2 ) / 2. It has 5th/4th and 3rds/6ths equally less pure, with 5th 698.81867 cents. 1/3 meantone 694.78624, 1/2 meantone 691.20186. Let M stand for 'syntonic comma meantone', and m(a,b) 'just in between of a and b'. Pythagorean tuning = 0 M.
1/2 comma meantone = 1/2 M.
1/3 comma meantone = 1/3 M.
7/24 M = m( 1/3 M, 1/4 M). 7/48 M = m( 0 M, 7/24 M). 1/6 M = m( 0 M, 1/3 M). 1/8 M = m( 0 M, 1/4 M). 7/48 M = m( 1/6 M, 1/8 M). To be sensitive to tunings, Plot note-key points by way of 2D-Intervals and delta pitches in Cents, always reflecting them linearly. That is, plot note-key points of C, D, and E regularly on a straight line only in that case where D is tuned at the just center (mean) of C and E.
Any transformations are allowed as long as this mapping linearity is maintained. 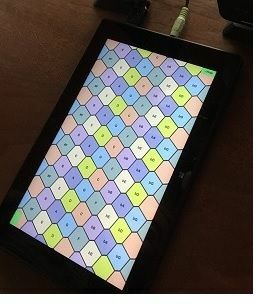 On an instrument board, you can draw buttons as Voronoi cells (Euclidean distance), enhancing 2D looks and feels. Plot also Harmonic-series tone points in the same way. You see points of tuned note-keys and Harmonic-series tones on an equal footing. Irregular tunings (temparaments) such as Werckmeister will have irregular (not straight) outlooks corresponding to their irregularities (curves). Download the linked zip file (Intervalon20180917.zip, 9.5MB) containing the latest Intervalon folder. then unzip it (right-click -> Open -> drag the IntervalonYYYYMMDD folder inside to Desktop, for example). You can put the Intervalon folder (or later move it) anywhere you like. 'Soundfonts to use' folder initially contains a small soundfont of my compilation/modification, EditedforIntervalon.sf2. It has around 20 instrument tones (presets. Please try them all). It will be updated fairly frequently. I am improving it every day! Acknowledgements is in More Info.txt file. You can use your favorite soundfonts (.sf2, .sfz). Make shortcut files of them and put the shortcuts in 'Soundfonts to use' folder. Open Intervalon.exe. Administrative privileges are never required. The board window appears. (In the initial setting, middle C is at the window center. Now you can play (just touch note-key buttons), and change settings. Messages are displayed at the bottom of the window. For example, if you keep pressing two note-keys at the same time (cord), the interval and cents between are displayed. Enlarge the window by the Windows standard operations. Press 'Board options' button at the top-left corner of the window. First, adjust scaling by the buttons on the 'Scaling' line, first 'overall' then 'note-keys'. Scroll (change the note range covered) by the buttons on the 'scroll' line. Change orientation, aspect ratio, rotation. 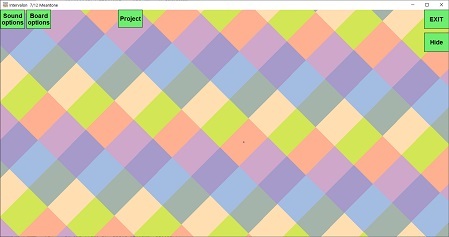 A couple of prototype patterns (Layout profiles) are provided. Note that you can cover many octaves range even with a small window, by changing aspect (x:y) ratio. Save the board settings into the ini file by pressing 'save options' button at the window top. This software does not save options automatically at program exit. Select a tuning to be played in. Select an audio device, a soundfont, an instrument tone (a preset in the soundfont). Alternately, you can use an external midi software/hardware multitimbral synthesizer. Check 'play midi-out' button, then select a midi-out device. For more details, see More Info.txt file. Save the sound settings into the ini file by pressing 'save options' button. 'Board options' --> check 'Harmonic Series Tones' button, or 'PAD' button. Specify the primary (first) tone by mounting a harmonic series tone button on any board note-key button. To go for very low latency levels, you can use Windows audio Exclusive-mode by simply checking 'exclusive' button. Response times are adjusted by two items in a sound profile, 'audio latency (in-app)' and 'delay note-off'. A sound profile has many items but there are on screen only two lines for them, so change items displayed as needed. 'Sound options' --> check 'double by interval' --> select an interval. Primarily, singing in Unison. it is the most basic. Another is for a virtual composite instrument. Note that this Principal '4 will dynamically tune to the tuning you are using, not fixedly by the soundfont preset. A couple of key-mapping sets are provided, for typical keyboard physical layouts. First, select a keyboard physical layout nearest to yours. 'Board options' --> 'PC keyboard key playing'. 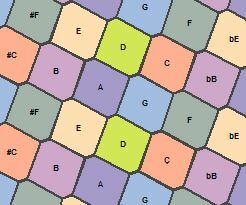 If middle C is at the window center, Note-keys C-D-E-F are played by keyboard keys G-H-J-I (K F#). If you scroll the board, note-keys played will change accordingly. If middle C is at the window center, C-D-E-F are played by keyboard keys 7-U-J-M.
For more customizations, such as add tunings, change colors, change HS pad layout, add PC keyboard-key mappings, etc., you can edit the ini file (Intervalon.ini in the Intervalon folder) with your favorite text editor. Download the latest Intervalon folder from this site. In most cases (not across a major update), you can copy the old ini file to the new folder. Play under a moderate sound volume. Do not play too long hours at a time; Take enough breaks. If instrument sounds are unpleasant in any way, stop playing immediately. Copyright © 2015 Kazuhiko Shirai. Intervalon is freeware. It can be used anyway. The software is provided as is without warranty of any kind. Use it at your own risk. The author is not responsible for any loss or damage resulting from the use or misuse of it.